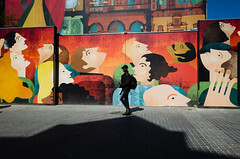 Today before Brian and I hit the Dutch-way Grocery store, we looked for a few caches. It was in the 20s, but felt colder. Luckily, we found them in 5 minutes or less. 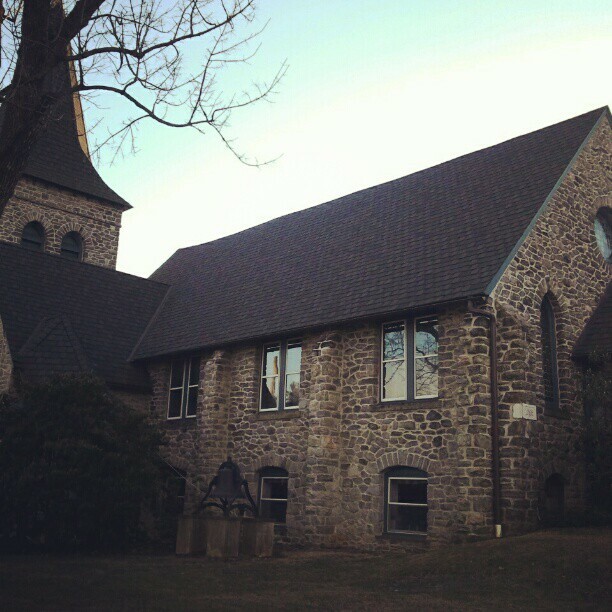 The first place was off a parking lot of this lovely church in Cochranville, Pa. Some man was sitting in a delivery van almost parallel to the cache-wonder if he was a cacher too? When we got out, he left! Anyway, I narrowed my search to a tree trunk and there was the cache. So we had a little time to kill, so we went down another country road and looked for a cache we tried to find at night a few months back. But then we were in the right area, but you just can’t find a fence ‘nano’ in the dark. Again, Brian spotted it with his eagle eyes. 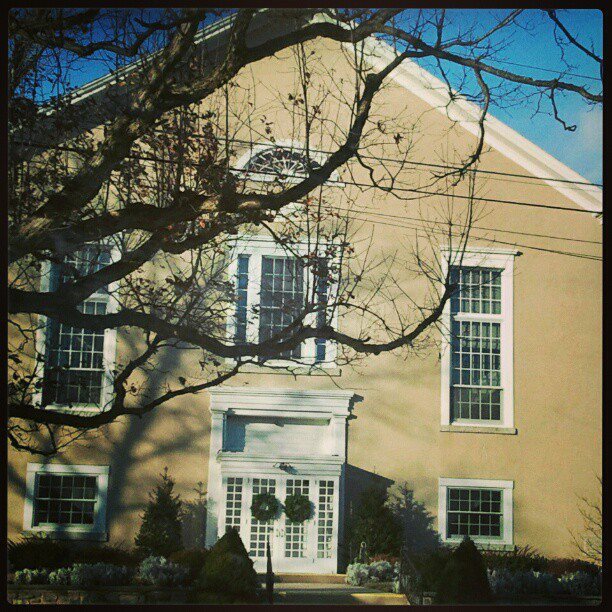 Across the street was this lovely church in Parkesburg, PA. Love the bell! I have a small set of other churches on Flickr. So we went food shopping and were happy to get some good ‘buy 1 get 1 free’ items. I had run out of canned or frozen veggies. Last night I looked and all I could find were a few sweet potatoes which we had with our dinner. 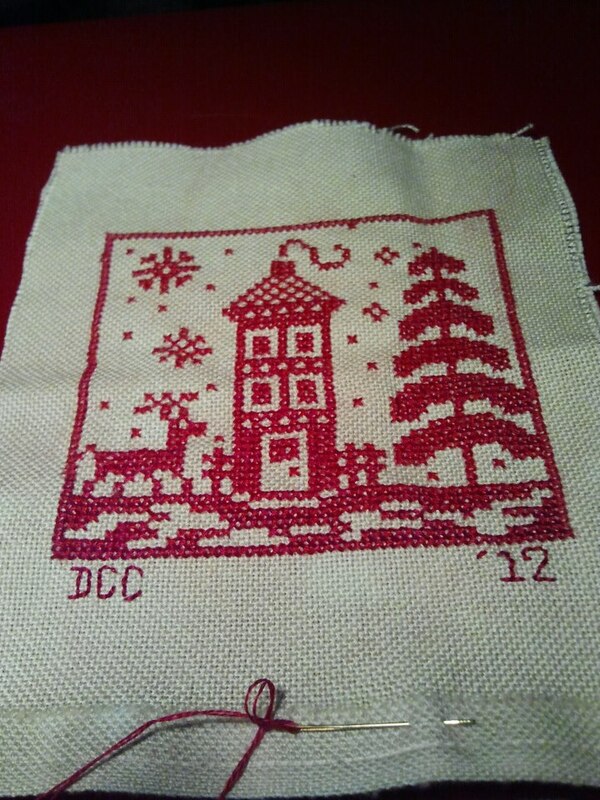 I’ve been doing a little cross stitching at night. I finally finished a Christmas ornament and started one for another holiday coming up soon! I have gotten a little rusty. I do have a nice floor lamp I bought to shine on the project (thanks Habitat for Humanity). Next I want to get to my paper crafts again! Update-Sean’s car has been at a local restoration place for a few days now. The appraiser said it can be repaired and gave us a check. He didn’t count the steering issue. Sean got a loaner car in the meantime. So we are hoping the restoration place doesn’t want more than what’s on the check. 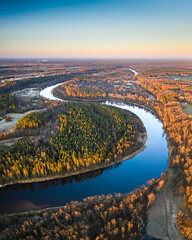 Anyone who is interested-please click here or the above tab. I have stitched the kitty, but the other items are new in their original packaging. 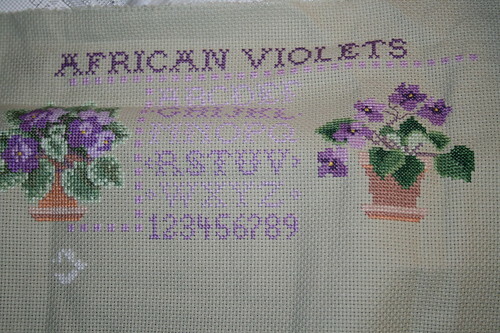 Cross stitch African Violet Sampler, originally uploaded by DianthusMoon. 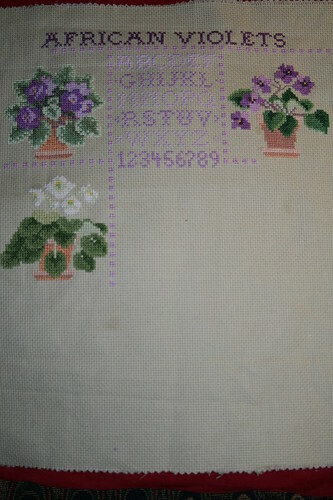 Progress on African violet sampler, originally uploaded by DianthusMoon. Not many stitchers work on Aida anymore. I had this pretty mossy green piece and decided it was definitely fine for samplers. I want to alter this a bit-after the numbers there they have the wording-‘to grow them is to love them’. Ugh. I think I will put the Latin word for them ‘Santapaula’ there instead. I’m losing the little hearts it calls for in the corners too. The violets themselves are really detailed and pretty. Everyone is home today-Bri went to the doctor (he continues to not feel well) and Sean had off. Sean is itchy to go get some Trader*Joes goodies. I had a little nap as the kitty got me up at the crack of dawn as he heard Bri get a drink and I was pretty much awake after that. At first I thought I was a mixture of both kinds of stitchers. But after I did really think about it, I think I am a process stitcher. I say this as I can take breaks from stitching and not worry about getting something complete, unless it’s for a gift or is charity stitching. Although I love to finish something, I found it’s the last few stitches in a piece at are the most satisfying. That being said, I will take a few photos of what I’ve been working on. Another love in my life-collage is all about getting the pieces together to create that special piece of one-of-a-kind art. Tell me that isn’t process work? 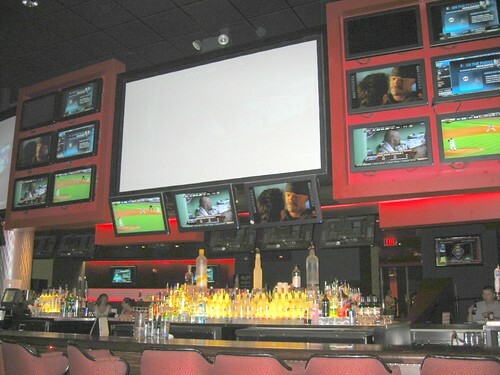 Mall sports bar, originally uploaded by DianthusMoon. This is a SPORTS bar and restaurant at the mall in Atlantic City, NJ. My guys almost lost their eyes when they saw all the tvs that were all tuned in to some kind of sports. My mom and I did tolerate it for the short time we were there although it was very loud. The big screen did have a ball game on. The bar was nicely lit too. Unfortunately this mall is getting known for people falling off their very steep escalators with very bad consequences. It’s happened twice in a year now. If you happen to like to cross stitch and are looking for new stash, my friend Barbara is selling off some of hers here. Mosey on over if you please. I think I’ll put up a few of mine too-I actually have more than a few, so watch here.